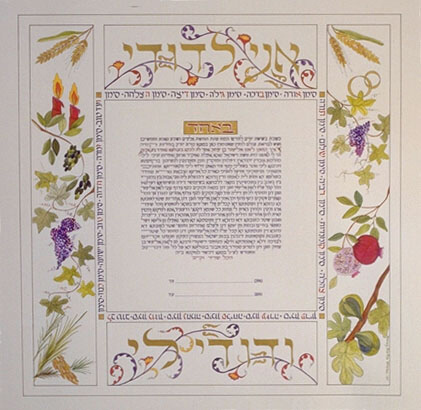 The Ketubah is illuminated with the Seven Species which the land of Israel is blessed with. The fruits are surrounding the Orthodox Hebrew purple text. Above and below the text in gold paint the verse from the "Song of Songs": "Ani Le-Dodi Ve-Dodi Li". Within the inner frame in Alphabetical order are blessings to the married couple.